Today the Royal Institute of British Architects (RIBA) announced Neave Brown as the recipient of the 2018 Royal Gold Medal. The medal, approved personally by Queen Elizabeth II, recognizes a lifetime of achievement in the field of architecture, and is considered to be the highest honor an architect can receive in the U.K. Past recipients have included Zaha Hadid, Oscar Niemeyer, Rem Koolhaas, and Frank Lloyd Wright. Such a prolific career as Brown’s might seem a blur in retrospect, but his achievements are numerous. The New York–born architect, now 88 years old, is best known for his housing complexes in the UK. His most famous structure, the Alexandra Road Estate near London’s Abbey Road (completed in 1978), features a Brutalist ziggurat of concrete, tiered apartment buildings obscuring the sound and vibrations of an adjacent railway. The lush grounds of the estate, which contains 520 residential units, are also home to a large park, community center, and school. Another, earlier project at Winscombe Street (completed in 1963), took its inspiration from housing structures by modernists like Le Corbusier as well as traditional London terraces. It is a set of five houses built of concrete and brick with a communal garden attached. In signing on to live there, residents are obliged to sign an agreement Brown himself wrote up: They must participate in the garden’s maintenance as well as occasional events hosted at the houses. As Brown wrote in the rules, the garden was meant to be a shared space whose “combination of freedom, community, and privacy is valuable and vulnerable,” a social resource he took very seriously as a design element. 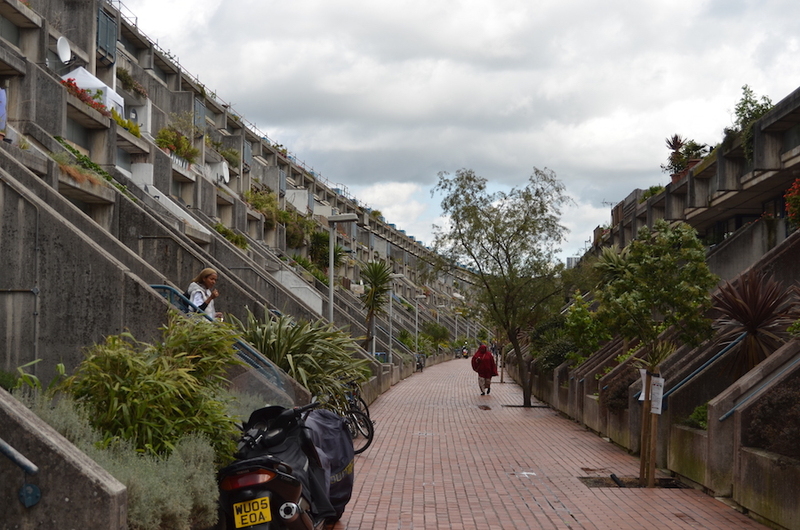 The houses at Winscombe Street and the Alexandra Road Estate have been listed (landmarked) in the U.K, as well as a third housing project on Fleet Road (also a split-level structure with inward-facing terraces), completed in 1977. This makes Brown the only architect to have all his projects listed in the U.K.
At the ripe age of 73, Brown retired from architectural work to pursue a Bachelors in fine art, a passion he put aside at 20 years old for a career in design. With this medal, the entire architectural world has a reminder of his contributions to the field, and to thinking about social housing writ large. May 29, 2018 What can architects learn from London’s best social and urban housing projects?